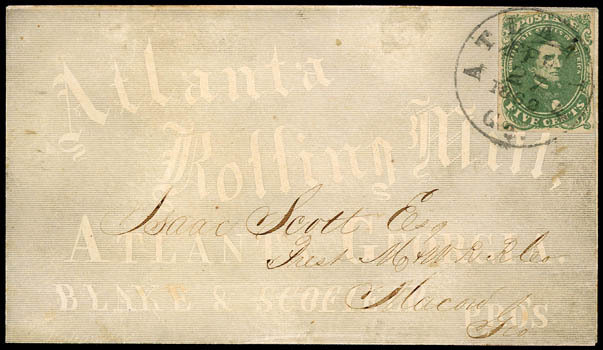 Confederacy, Atlanta Rolling Mill, all-over gray shaded ad cover bearing 5¢ green, Stone 2 (1), four large margins, rich color, tied by "Atlanta Ga. Feb. 27, 1862" cds addressed to Isaac Scott. Pres. M & W R.R. Co., Macon, Ga." (Macon & Western), Very Fine and attractive. Scott No. 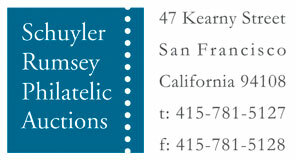 1 Estimate $500 - 750. 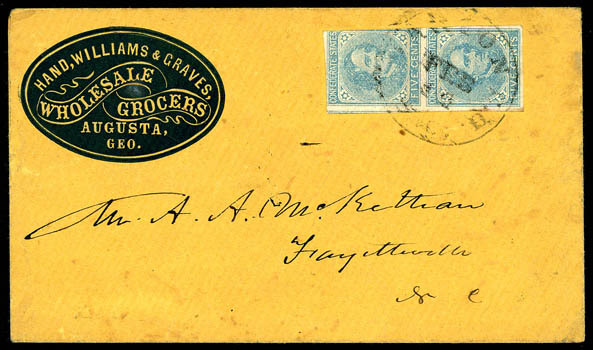 Confederacy, Baker & Caswell Wholesale Grocers, Augusta Ga., fancy blue embossed cameo corner card on cover with "Augusta, Ga. Jun 25" double-circle datestamp and matching "Paid 5" straightline rating handstamp (Type D) to Washington Ga.; reduced slightly at left affecting cameo, otherwise Very Fine and attractive. Confederacy, Carroll County Manufacturing Company, Carrollton Miss., blue oval corner card handstamp on cover with "Carrollton Miss., Sep 23 1861" cds and matching "Paid" and "5" rating handstamps from the Carroll Hoy & Co. correspondence to New Orleans La., manuscript "Chg 53" charge box notation, Very Fine, ex-Myerson. 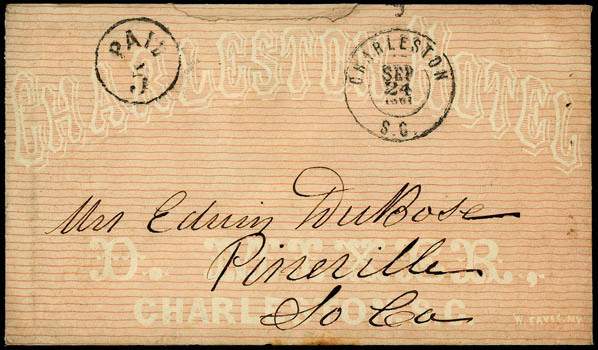 Confederacy, Charleston Hotel, all-over peach shaded advertising design on cover with "Charleston S.C., Sep 24, 1861" cds and matching circled "Paid 5" rating handstamp to Pineville S.C., flap with W. Eaves, N.Y. imprint, small opening tear at top, Fine and attractive. 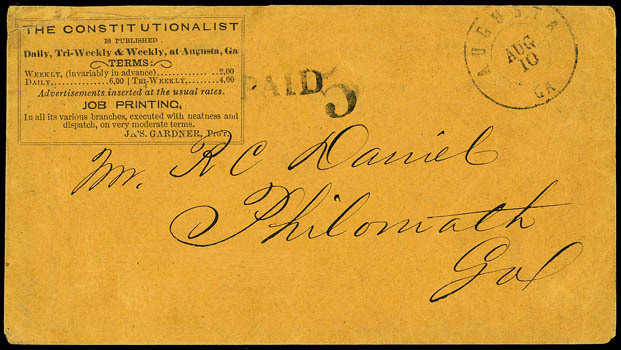 Confederacy, Commercial Bank of Alabama, Selma, Ala., boxed corner card on light buff cover bearing 5¢ green, Stone 2 (1), large margins, pos. 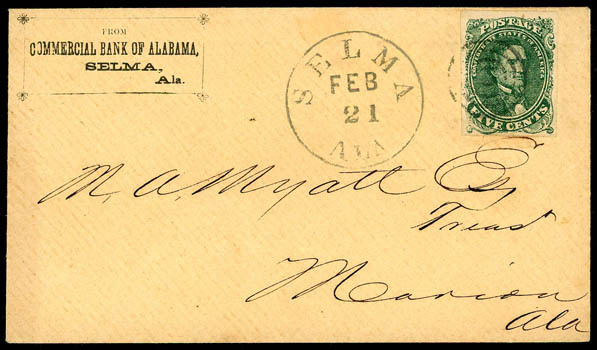 16, tied by four-ring cancel, matching sharp "Selma Ala., Feb 21" cds to Marion Ala., fresh and Very Fine. A CHOICE CONFEDERATE ALABAMA ADVERTISING USE. Confederacy, The Constitutionalist, framed newspaper corner card on orange cover with "Augusta Ga., Aug 10" double-circle datestamp and matching "Paid" "5" rating handstamps to Philomath Ga.; top left edge mend slightly affecting c.c., partial flap, otherwise Very Fine, ex-Kohn. 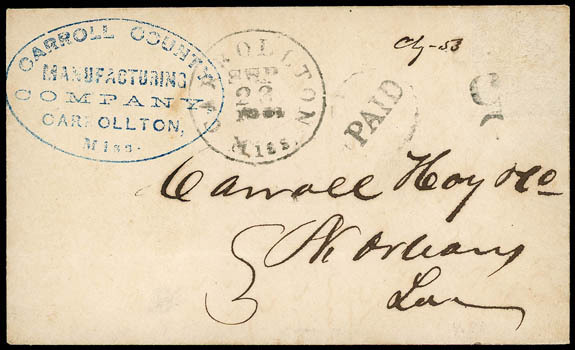 Confederacy, Hand, Williams & Graves, Wholesale Grocers, Augusta Ga., blue embossed cameo corner card on buff cover franked with a 1862 5¢ local print, vertical pair (mostly large margins) tied by "Marion C.H., S.C., Feb 14" cds, to Fayetteville, N.C., Very Fine. 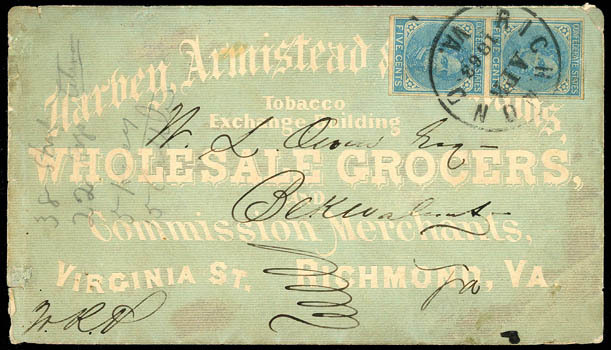 Confederacy, Harvey, Armistead & Williams, Wholesale Grocers & Commission Merchants, Richmond, Va., aqua blue all-over shaded advertising design on cover bearing 5¢ dark green, Stone 2 (1b), pos. 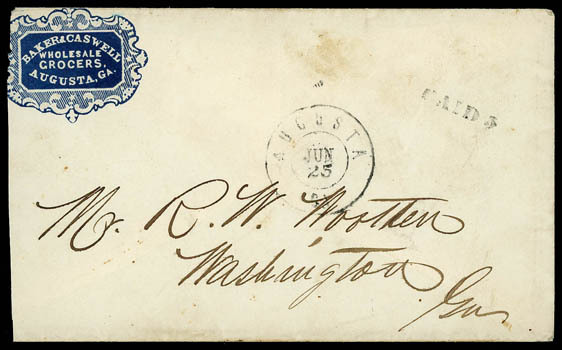 5, four margins, tied by "Richmond, Va., Jan 18, 1862" cds to Massie's Mill, Va.; slightly reduced at left, Very Fine. 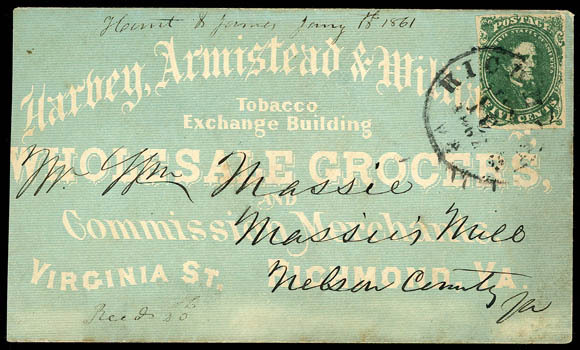 Confederacy, Harvey, Armistead & Williams, Wholesale Grocers & Commission Merchants, Richmond, Va., greenish blue allover shaded ad design on cover franked with 1862, 5¢ blue, Archer & Daly printing, vertical pair tied by "Richmond, Va., Apr 1863" cds; cover with small edge faults particularly along left edge, F.-V.F. 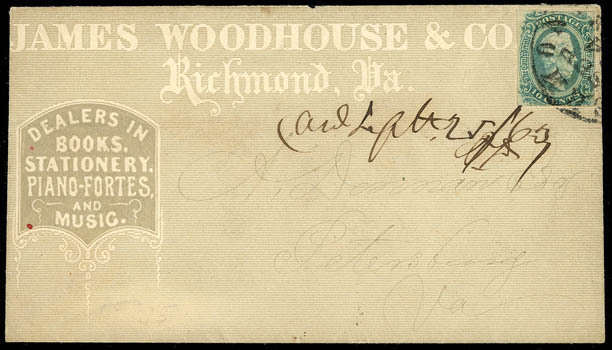 Confederacy, James Woodhouse & Co., Richmond, Va., Dealers in Books, Stationery, Piano-Fortes and Music, allover shaded gray brown advertising cover franked with 1863, 10¢ blue tied by "Richmond, Va., Sep 24" cds, to Petersburg, Va.; sealed flap tears and faint horizontal fold, contents docketing at center, Very Fine, a lovely and rare illustrated design, with only five recorded in Baum ad census, ex-Dr. D.C. Warren. Scott No. 11 Estimate $500 - 750.